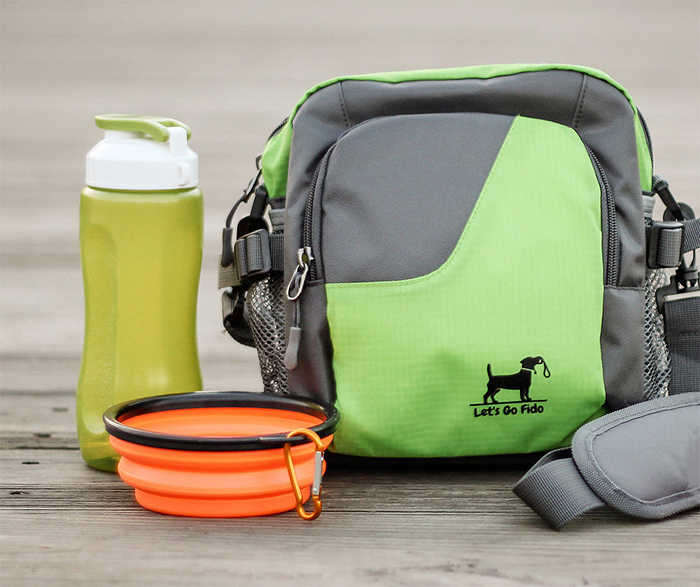 The Let’s Go Fido Bag has revolutionized my outings with the Boys! How in the Doodle have I existed without this? Waist or Fanny Pack – Simply attach straps to the upper clips and adjust to fit. Shoulder Strap or Cross Body Strap – attach straps to upper clips. For additional length, clip the 2nd strap to the 1st to make one long strap. Adjust to fit. Back Pack – use both straps. Attach one strap to upper clip on bag, the other end of strap to the bottom clip on the same side. Repeat on the other side. Adjust to fit. *Shoulder Pads – are optional and can be slipped off the straps or worn. walking a distance and don’t need to remove it often. walking with someone who can go in it for me if need be. I could easily get to everything – phone, trading cards, business cards, treats – whenever I wanted. Currently priced at $31.95 on Amazon – it’s a steal!!! 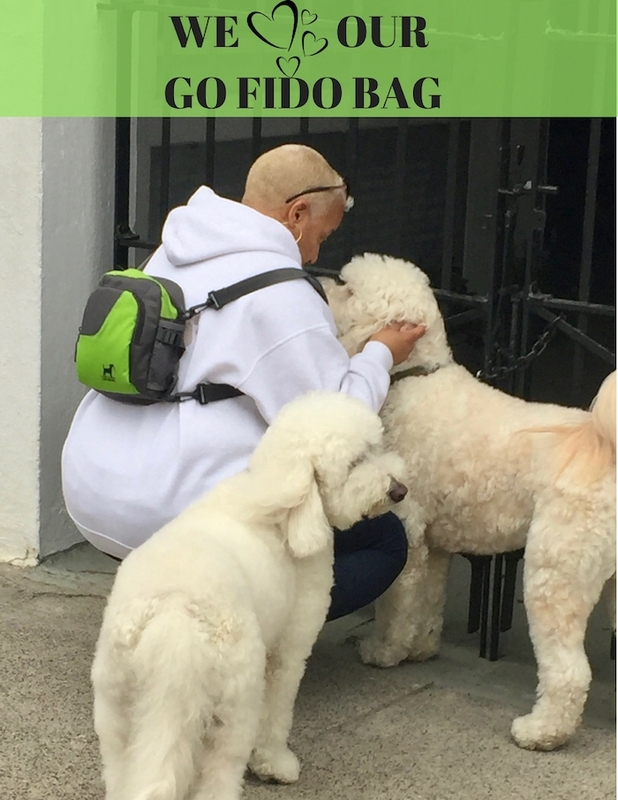 Let’s Go Fido has graciously offered one lucky Groovy Goldendoodles™ reader a chance to win a bag, so enter today…. Disclaimer: I was provided a Let’s Go Fido Bag in exchange for an honest review. 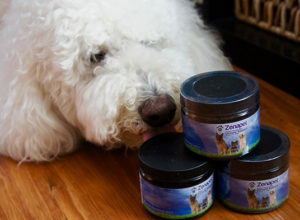 Groovy Goldendoodles™ is not being compensated for the words written about this product. I only share information I feel is relevant to our readers. I don’t use a bag when out, but we sure could use one! Misha is so finicky. She will not drink from a dog bowl that another dog has drunk from. This would be awesome to have when we go out. Melody – I was the same way, but this bag is so user-friendly. I’m in love with it. Harley is like Misha, he would rather pant out loud vs. drink from a community bowl LOL. That looks like a pretty cool bag. Hands free leash, and hands free bag and we would be ready to roll! Love it!! I use a bag that is as old as Dash! And in less than a month that will be 11 years. But, it works. But, I like that you can carry a water bottle in this one! Great post, Cathy! Hey Deirdre – thanks! Yep – the water bottle holds enough to satisfy both Harley and Jaxson. With everything I had in there, I never felt weighted down either. I’ve always used my pockets. Sometimes I feel like Captain Kangaroo. Our car is never very far, so if I need something that’s not in my pocket, I can always go to the car. Your post with the video is a hoot. 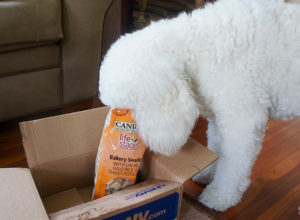 I love Harley nosing the bag for treats! 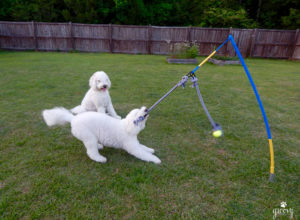 We thank you so much for your wonderful review of our Let’s Go Fido dog walking bag! We are animal lovers (pet parents to 2 dogs and 2 cats at the moment!) 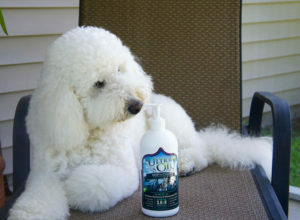 and love that we can offer a product to make pet parents life just a bit easier. We love your blog and your doodles are gorgeous!!! If your readers have any questions, they can contact us at letsgofidollc@gmail.com. And we look forward to shipping out a free Let’s Go Fido bag with accessories to your lucky winner! Thanks Lorrie – this was such a joy to write about because the bag is A-mazing!!! Can’t wait for the winner to receive one. I don’t currently use a bag but could really use one! I have three rescued Treeing Walker Coonhounds. My boys, Kenji and Seiji, are eight years old, but my little girl, Megumi, is just 14 months old and very much still a puppy. 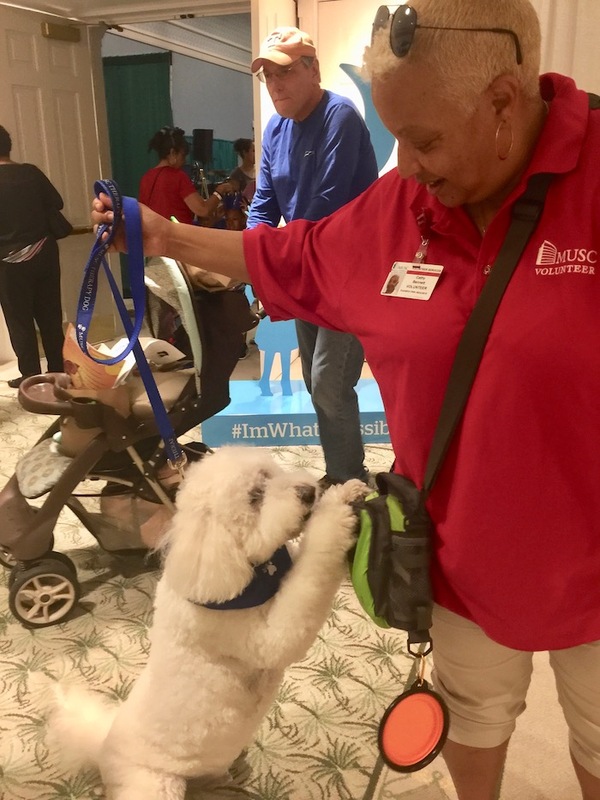 I need a way to take training treats with us, plus poop bags, my cell phone, and sometimes keys. This would be perfect! 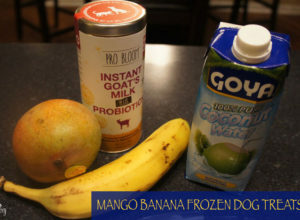 Linda, this just might be the answer to your prayers! I have since put all the other bags I’ve purchased over the years in the back of my closet, this bag does it all for me. Yes 🙂 currently use a bag, one of the ones that has draw strings on it Would love to have one of these. 🙂 For my 2 year old miniature pincher beagle mix and 3 month old border collie. I know the bag you’re describing! I have several of those too. Melody the raffle is over, but I would recommend everyone to take advantage of the 25% discount offered using the code “GROOVY” it is a great price and I doubt you’d be disappointed. Great bag for all your pet parent needs! 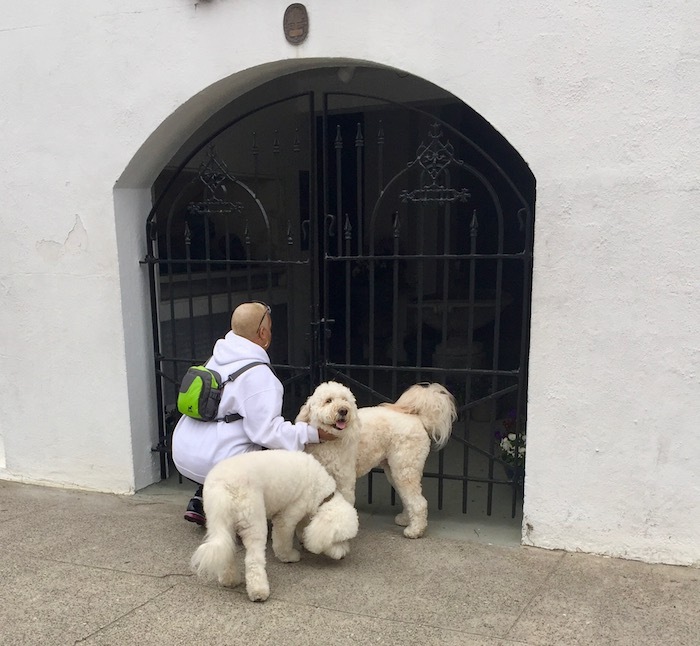 I always use a bag when out with my 2 GoldenDoodles. We travel to FL for 2.5 months a year and a bag is always handy fir travel ans hiking. What I like about thia bag is the versatility of ways to carry. I have a backpack I use when we hike, a fanny pack type when we r training and a crossbody for shopping. When hubby carries he just likea a handle. So this is perfect. Easy to clean as well. It’s everything you’ve described all rolled into one plus the little handle. I can’t see myself using anything else – I’m serious…. Such a good idea. 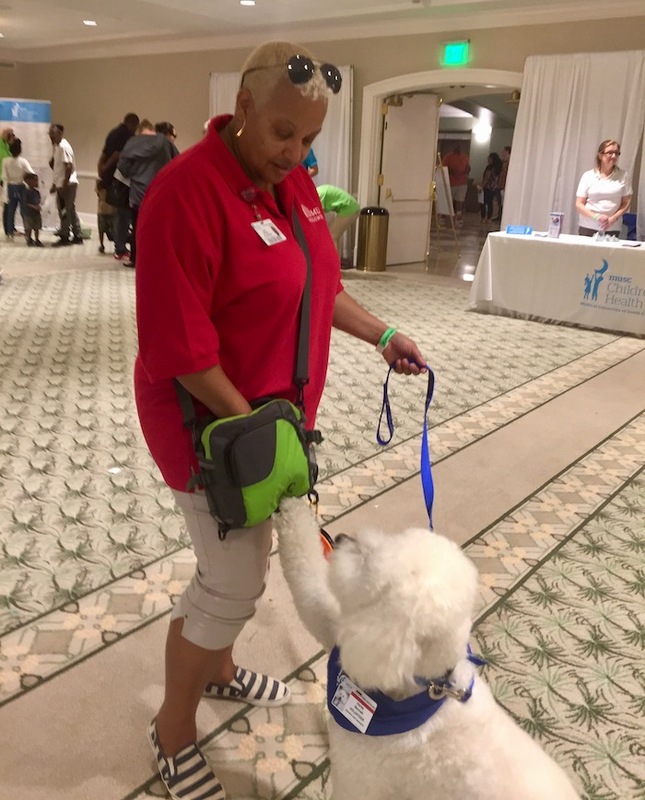 Would love one to take on Therapy Dog visits!!! I need to use a bad especially to carry water in. Especially with the warmer weather coming. I agree. This bag comes with a decent size bottle and fits inside and out of the bag. I often look like the bag lady when I take the Boys with me, once I started using the Fido Bag, I have added to my list of essentials and it always fits. This bag is amazing. Amazing. This is a great bag for warmer summer trips to the dog park and hiking. Can’t wait to go buy mine! Use the code “GROOVY” from our homepage ad and receive 25% off. It’s a great value 🙂 Thanks so much for stopping by, come back again soon! Its definitely made a huge difference to me when I’m traveling with the Boys. I love it! Yes, I do – I have a fanny pack. I started using 1 when I did therapy work with my first Beagle – now I use one whenever doing anything with my dogs. 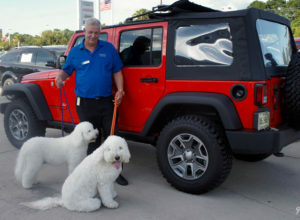 I’ve always used one Kim, but the ones I had were either too small and couldn’t hold everything for two dogs, or – it was too big which made it bulky and heavy. This just seems to be shaped right and sized perfectly. Thanks so much for stopping by, come back again soon! I have a little bag but it’s not nice like this one! Natalie – this one will blow your mind. I love it, it’s my go to bag now everywhere we travel. Thanks so much for stopping by, come back again soon! It’s been a huge game changer for me. I love it! I truly enjoy this over all the other bags I’ve tried in the past. It may look small but it holds a great deal of stuff. I am notorious for carrying much more than I need, and I’m never feeling weighted down when I use this bag. I’ve already thrown all the others in the back of my closet 🙂 Hope you take advantage of the 25% discount for next two weeks. Remember to use the discount code “GROOVY” and thanks so much for visiting us, please come back again soon. Well if you’re looking for something that offers multiple carrying styles, then the Let’s Go Fido bag is what you want. It works well in all of its versions.